Dramatically increase the security in your office or home by adding a horizontal cut to your shredding. By doing this you drastically increase the difficulty of identifying a document making the shred size exponentially smaller. When browsing our selection you will see this line ranges from personal use, to high capacity, high volume use. We are also proud to say we carry a large selection of the industry's finest brands including Fellowes, HSM, GBC, and many more. Just determine the volume you or your organization needs for optimal shredding to get you into the right machine. If you need assistance with this, feel free to contact our customer service at anytime! Welcome to MyBinding video. Oh the cross cut shredder. Cross your heart, cross your keys, cross your cut or something like that. If your office or business needs a higher level of security for your shredding, you may want to consider a cross cut shredder. These machines are manufactured by many of our great companies and can achieve a level 2, 3 and 4 security for your shredding of documents. Many of these machines can also process CDs, DVDs, credit cards, and they can range from just a few sheets at a time all the way up to hundreds of sheets. Depending upon your budget, these machines can be pretty fast or pretty slow because cross cut shredding is a lot more work on the motor. 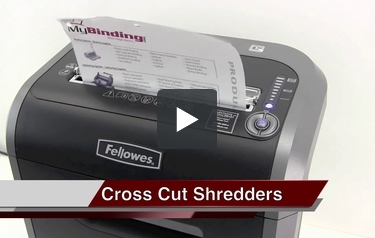 Here at MyBinding, we try to make a video for every product that we sell, so you can see many of these shredders in action before you buy, as well as how-to videos on taking care of them. Security, document destruction, and documents shredding is very important to the security of your business, so take your time, shop around and get the perfect machine. Give us a call if you need any help at all. For more demos, reviews and how-to’s, check out MyBinding.com.